THE Federal Government will soon embark on crack-down of those contravening the National Tobacco Control Act, NCTA, which prohibits the selling of cigarettes to minors and also selling single stick of the tobacco products. This was disclosed by the head, Tobacco Control Unit, Non-Communicable Diseases Division, Federal Ministry of Health, Dr Mangai Malau at the advocacy programme organized by Gatefield Project in Abuja yesterday. Dr Malau who was represented by the Senior Scientific Officer, Tobacco Control Unit, Mr Emmanuel Abraham said that a task force will soon be set up to apprehend those who sell cigarettes to minors and minors below 18 years who hawk cigarette product as well as those selling single sticks cigarettes. He said that the Minister of Health, Prof Isaac Adewole, has been in the vanguard to ensure that tobacco menace was reduced drastically in the country. He commended Gatefield Project, Consumer Protection Commission, CPC and other partners in ensuring smoke-free environment. In his address, manager of Gatefield Project, Sola Bakare said that the programme was conceived to focus on advocacy for the prohibition of selling tobacco to minors and single sticks. 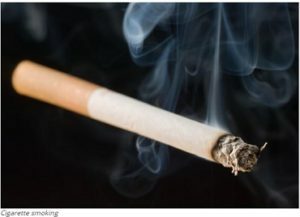 Bakare said findings from a recent survey on the sale of tobacco revealed that “not only does a quarter of our minors have access to killer tobacco products, but there is also a sense that there are no consequences for the violations of the law. This is why awareness must be ramped up. But beyond that, awareness creation must be followed by strong political will by the implementers to enforce these and all other provisions of the law. According to him, “One in four vendors of cigarettes and other tobacco products sold to minors (persons below the age of 18) in Nigeria. The finding was made in a Tobacco Sales Violation survey report titled“Tobacco vs The People”. “Nigeria has since passed a law, the National Tobacco Control Act 2015, which prohibits among others – tobacco sales to and by minors; sale of cigarettes in single sticks; and Tobacco Advertising, Promotion, and Sponsorship. “The survey was a result of a crowdsourcing campaign involving volunteers who mapped about 2,088 points of sale including Kiosks, Restaurants, Bars, Supermarkets and other retail outlets across various parts of the urban cities in the four selected States in Nigeria including Edo, Ekiti, Katsina and the Federal Capital Territory, Abuja. He said that findings revealed that “One in four vendors (25 per cent) sell Cigarettes and Tobacco products to people under the age of 18 in Nigeria. Half (49.6 per cent) of the cigarette vendors in Abuja – Nigeria’s capital city – sell cigarettes to people under the age of 18. “A substantial percentage of vendors (more than half of those who admitted to selling Cigarettes and tobacco products to minors) were seen selling cigarettes to people below the age of 18. (13.46 per cent) of vendors were observed selling to minors out of the 25.24 per cent that admitted to selling cigarettes to minors. “Majority of vendors support the ban of Cigarettes and Tobacco sales to minors but almost half of the vendors (41 per cent) are unaware of the law banning the sale of Tobacco to minors. “Majority of vendors (89 per cent) are unaware of the law banning the sale of cigarettes in single sticks and do sell the products in single sticks (84 per cent). Already, the Nigerian government through the Consumer Protection Council has recently taken the right step forward by carrying out enforcement exercises in two public parks and Wuse market in the Federal Capital Territory, Abuja. Other implementing agencies are urged to take this line of action and in a manner that ensures that citizens are onboard. Also speaking, Bode Olufemi of Environmental Rights Actions, ERA, advised the Nigerian government to take more action in ensuring a tobacco-free environment. He said that the law enforcement agencies were not doing enough to ensure the enforcement of the law prohibiting advertising of cigarettes and selling of the products to minors.